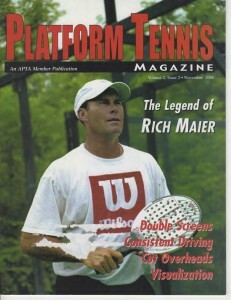 Richard Maier first showed up on the platform tennis scene as a finalist in the Junior’s, but he set the paddle down for a few years, during which he made a considerable mark in college racquet sports, and later spent a brief amount of time in Europe and India trying to make money playing the tennis circuit. On returning home, he picked up his paddle racquet again and his play improved faster than anyone else in the history of the game. From 1980-1992, Maier made the Men’s Nationals finals each year, winning ten titles, including four in a row (1980-1983) and five in a row (1988-1992). Only two other players—Flip Goodspeed and Scott Mansager (1996-2000)—have matched Rich’s feat of five in a row. A paddle entrepreneur, Rich is the Hall of Fame’s only patent holder. 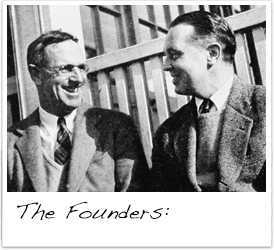 Starting by building paddles in a garage, he later formed Advanced Recreation Design to design and sell new paddles and a ball. Along the way, Rich developed a reputation as one of the best teachers of the game and instilled a love of the sport in his junior students. 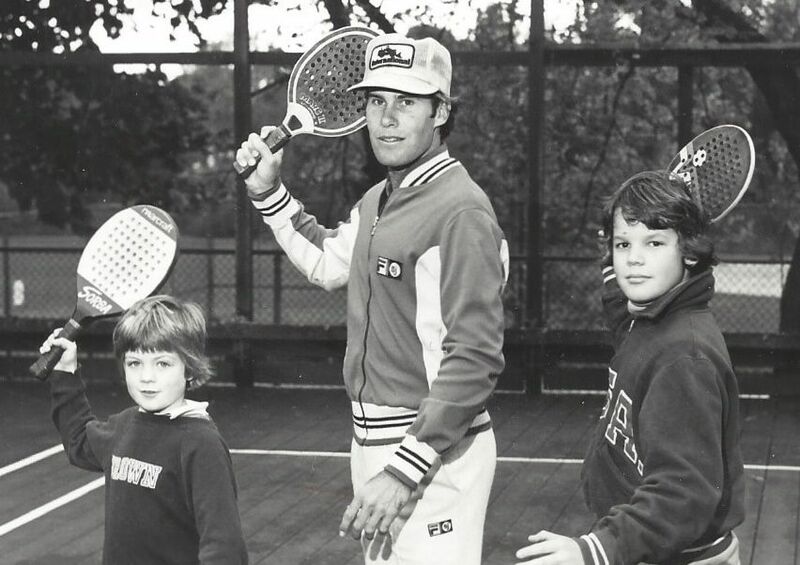 Maier grew up in Westchester County, NY, and attended Mamaroneck High School where he was active in a number of sports, but did not get serious about tennis until his junior year. His racquet skills developed quickly, leading to a tennis scholarship at Jacksonville University, Jacksonville, FL, where he started playing varsity tennis in his sophomore year. He made a mark on the school’s racquets program by winning singles, mixed, and doubles titles in tennis, and singles in badminton. 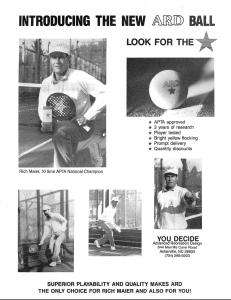 After graduating in 1975, Rich went to Europe, and then to India, to play in whatever tennis tournaments he could enter. While an educational experience, it was not too remunerative financially and he returned to the U.S. after a few months. 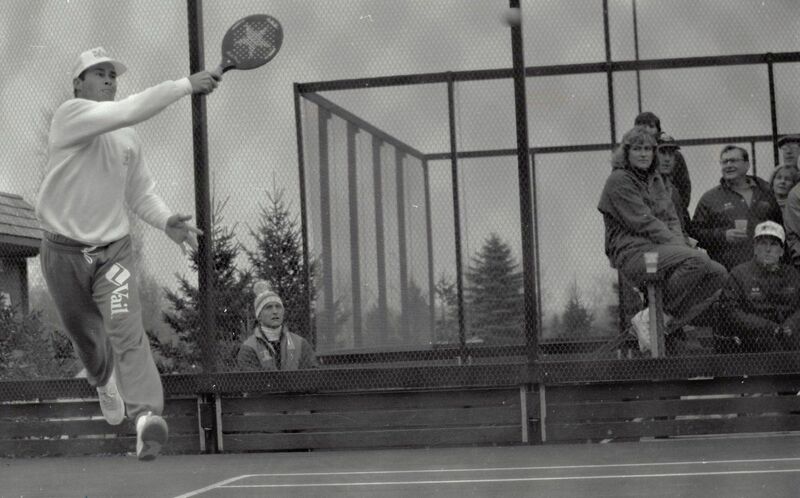 A friend named Jay Edwards first introduced Maier to platform tennis while they were both at high school, but, while at Jacksonville, there were few opportunities to play. After Rich got back from his overseas stint, Jay got him to take platform tennis more seriously. They entered their first tournament in 1976 and defeated Keith Jennings and Chauncey Steele, the previous season’s national champions, in their first round match. They were both 23 at the time. As the years went by, Maier’s game improved faster than anyone else in history and, from 1980-1992, Rich and his partner, Steve Baird, made the National Championship finals each year, winning ten including four in a row (1980-1983) and five in a row (1988-1992). Only two other players have matched Rich’s feat of five in a row. All but one of Rich’s ten national titles were earned with Baird. Maier and Baird’s most memorable match was the 5 hour 40 minute duel with Greg Tully and Tim McAvoy in the 1985 Hartford Invitational finals. Spectators watched a couple of hours of paddle, ate dinner, and returned to watch a couple more. At 17-16, in the fifth set, the umpire quit because of the cold, and Rich and Steve closed out the match the following game. 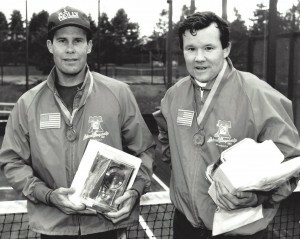 In mixed doubles, Rich was a finalist four times and a national champion once, in 1992. He won the National Men’s 45+ in 1998 and 1999 with Steve Baird, but hip-related issues started to plague Rich in 2000-2001. 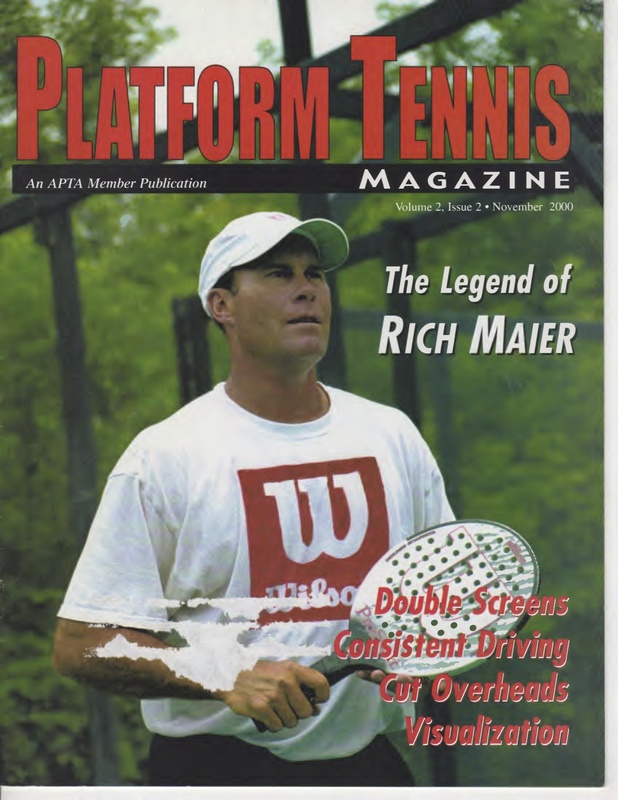 After surgery, he stopped playing competitive events and focused on teaching and this is where a large part of Maier’s contribution to platform tennis was made. His first position as a Head Pro was at Brookside Racquet and Swim Club in Allendale, NJ, starting in 1978. In more than three decades as a teaching professional, he inspired a love of the game in hundreds of paddle players. His ability as a teacher was best reflected by sentiments from some of his students: “To us, he was the cream of the crop, the best of the best, the Michael Jordan of paddle. He provided us with countless fond memories of paddle. The many hours we spent with him on a paddle court are invaluable beyond description. We admire him as an athlete, we love him as a friend, and we idolize him as a teacher.” Two of these pupils, Nick Swain and Mark Wilson, were National Junior Champions in 1989 and 1991. Without exception, youngsters and adults alike all enjoyed and benefitted from his advice. Well almost without exception. After several frustrating attempts to teach the basic techniques of platform tennis to one student, he was overheard saying to her, “Could I offer you a fee not to take another lesson?” The student was his mother-in-law, Roxanne Zilenziger. 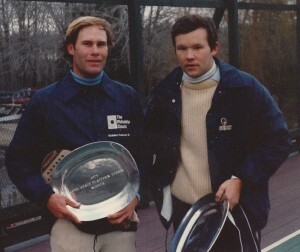 Chip Baird, who Rich had known since 1971 when he had lost to him in the finals of the Junior 18-and–under, played a significant role in encouraging Rich to get more involved in paddle. A number of years later, the Baird brothers sought out Rich for advice on how to beat Doug Russell and Clark Graebner (Greg Brents and Rich had a good record against this team but the Bairds did not). Rich’s secret was to bore Graebner. This relationship paid dividends when Chip had to retire from competitive play and Rich started teaming up with Steve. Maier was always been a pleasure to watch, with quick hands, fluid motion on the court, and accurate, relentless drives. In difficult situations, or when down in the score, he was unflappable, took his time, measured his opponents, and watched for the opening to work his magic. In summary, he was one of the most accomplished ad-court players ever to play this game. But, Maier was not content with just playing and teaching the game. He was an innovator, with a US patent (US4379554) as proof. 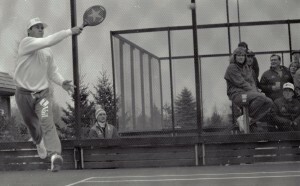 Along with co-inventor Andreas D. Schuyler, they developed a new concept for the platform tennis paddle. 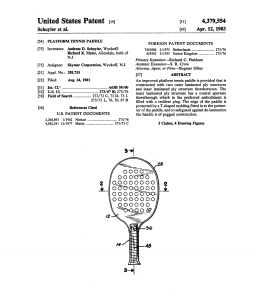 The patent, filed on August 24 1981 and issued on April 12, 1983, described an improved platform tennis paddle constructed “with two outer laminated ply structures and inner laminated ply structure there between. The inner laminated ply structure has a central aperture there through which, in the preferred embodiment, is filled with a resilient plug. 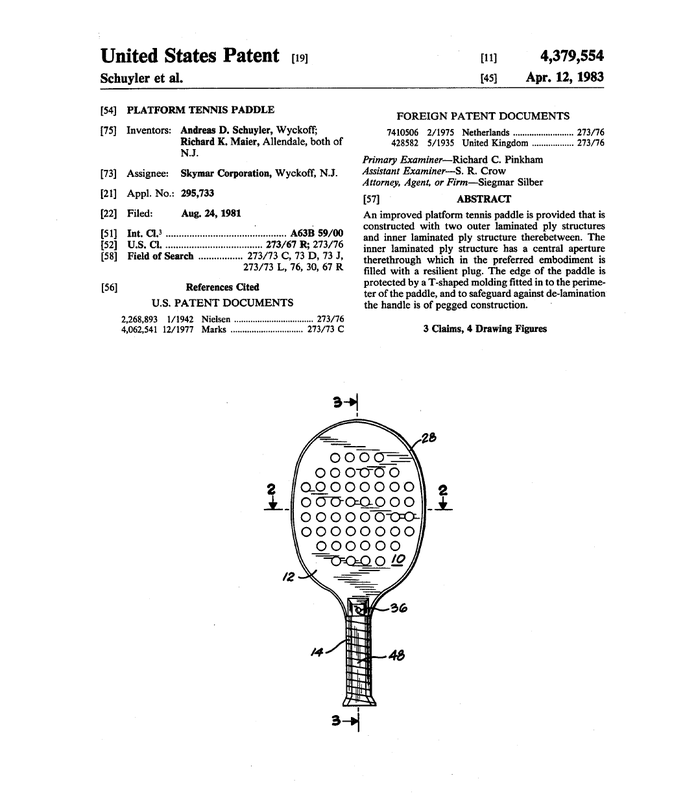 The edge of the paddle is protected by a T-shaped molding fitted in to the perimeter of the paddle, and to safeguard against de-lamination, the handle is of pegged construction.” The patent was assigned to Skymar Corporation, and Rich and Andreas built the racquet, Skymar Proflight, in a garage in Allendale, NJ. The racquet was a commercial success, but the garage manufacturing operation faced constraints and ultimately closed. The concept though endured and was picked up by another manufacturer, Marcraft. However, Rich was not through with innovating and started Advanced Recreational Design (ARD) in 1993, along with Gary Whalen, a friend from his Jacksonville days. ARD produced three new paddles and introduced a new ball that lasted much longer (six sets was not unusual) than the balls being sold at the time, primarily by Vittert. The ball had been developed with the aid of a manufacturer in Taiwan. With the initial positive market acceptance, they went into a 30,000 ball production run, only to find out that the samples used to test the balls against the APTA specifications did not pass. Both on and off the court, Rich was uniformly liked and admired by those who knew him. He was unassuming about his ability, and modest about his achievements. Always fair and sportsmanlike on the court, his calls were never questioned, and close calls were always made in favor of the opponent. Off the court, he never had a negative comment about anyone. If there was a fault, it was that he was a perfectionist and a “neat-nick,” so much so that he took over the laundry duties at home, because he didn’t like the way his wife, Susan, folded the laundry! Maier was also a giver, voluntarily helping with school events, women’s events, and charity events in Chicago, and often personally on a one-on-one basis. "My nomination for the best all around player of the last decade would have to be Rich Maier. Consistent, aggressive, and punishing. He keeps coming at you, always applying pressure and forcing errors".